a) Must have attained the age of 18 years and must not have attained the age of 22 years as on 1st July, 2018 i.e., must have been born not earlier than 2 nd July, 1996 and not later than 1st July, 2000. However, the Government of Telangana vide GO Ms No. 62, Home (Legal) Department dated 06-06-2018 have raised the upper age limit prescribed for appointment by direct recruitment by Telangana State Level Police Recruitment Board to various Posts in Police Department, Disaster Response & Fire Services Department, Prisons & Correctional Services Department and Special Protection Force by 3 (three) years. This relaxation is in addition to the upper age limit as mentioned above. b) For Home Guards, a Person who, as on the date of Notification, has been on duty as Home Guard for a minimum duration of 360 days within a period of 2 (two) years and who is still continuing his service as Home Guard, must have attained the age of 18 years and must not have attained the age of 40 years as on 1st July, 2018 i.e., must have been born not earlier than 2nd July, 1978 and not later than 1st July, 2000. However, the Government of Telangana vide GO Ms No. 62, Home (Legal) Department dated 06-06-2018 have raised the upper age limit prescribed for appointment by direct recruitment by Telangana State Level Police Recruitment Board to various Posts in Police Department, Disaster Response & Fire Services Department, Prisons & Correctional Services Department and Special Protection Force by 3 (three) years. This relaxation is in addition to the upper age limit as mentioned above. ii) For the Post Code Nos. 26, 27 & 28 : Must have attained the age of 18 years and must not have attained the age of 30 years as on 1st July, 2018 i.e., must have been born not earlier than 2nd July, 1988 and not later than 1st July, 2000. However, the Government of Telangana vide GO Ms No. 62, Home (Legal) Department dated 06-06-2018 have raised the upper age limit prescribed for appointment by direct recruitment by Telangana State Level Police Recruitment Board to various Posts in Police Department, Disaster Response & Fire Services Department, Prisons & Correctional Services Department and Special Protection Force by 3 (three) years. This relaxation is in addition to the upper age limit as mentioned above. a) Candidate if she is an SC or ST, must have attained the age of 18 years and must not have attained the age of 40 years as on 1st July, 2018 i.e., she must have been born not earlier than 2nd July, 1978 and not later than 1st July, 2000. However, the Government of Telangana vide GO Ms No. 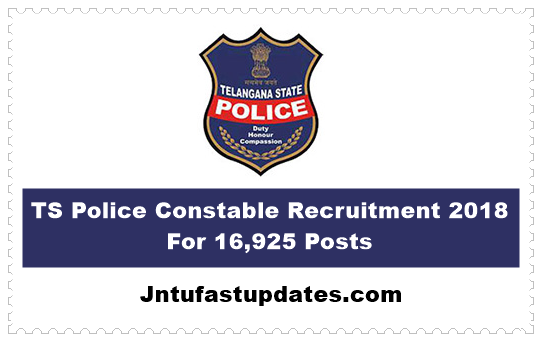 62, Home (Legal) Department dated 06-06-2018 have raised the upper age limit prescribed for appointment by direct recruitment by Telangana State Level Police Recruitment Board to various Posts in Police Department, Disaster Response & Fire Services Department, Prisons & Correctional Services Department and Special Protection Force by 3 (three) years. This relaxation is in addition to the upper age limit as mentioned above. b) In all other cases other than SC & ST, the Candidate must have attained the age of 18 years and must not have attained the age of 35 years as on 1st July, 2018 i.e., she must have been born not earlier than 2nd July, 1983 and not later than 1st July, 2000. However, the Government of Telangana vide GO Ms No. 62, Home (Legal) Department dated 06-06-2018 have raised the upper age limit prescribed for appointment by direct recruitment by Telangana State Level Police Recruitment Board to various Posts in Police Department, Disaster Response & Fire Services Department, Prisons & Correctional Services Department and Special Protection Force by 3 (three) years. This relaxation is in addition to the upper age limit as mentioned above. Note: A Candidate claiming age relaxation by virtue of being either a Widow or a Divorcee or a Woman judicially separated should produce the following documentary evidence. (i) In case of Widow, Death Certificate of her husband together with the Affidavit that she has not re-married since. (ii) In case of Divorced Women and Women judicially separated from their husbands, a certified copy of the Judgment / Decree of the appropriate court to prove the fact of divorce or the judicial separation, as the case may be, along with an Affidavit that she has not re-married since. The Upper Age Limit will be relaxable as described in the Supplementary Notification. Candidate must hold, as on 1st July, 2018, a pass Certificate in Intermediate or its equivalent examination recognised by the State Government. In the case of a Candidate belonging to Scheduled Castes or Scheduled Tribes, as on 1st July, 2018, he / she must have passed SSC or its equivalent examination recognised by the State Government and should have studied Intermediate and appeared for the Intermediate Examination in, both the 1st year and 2nd year. Note:- Candidates who possess higher qualification than the prescribed one will also be considered on par with the Candidates who possess the prescribed qualification. Desirous and eligible Candidates may apply ON-LINE only by satisfying themselves with the terms and conditions of this recruitment. Detailed information regarding Syllabi, Procedure for Online Application, distribution of vacancies, selection procedure, instructions to the candidate etc., is given in the Detailed Notification made available in the website www.tslprb.in. please extend the date on day.